James Chesnut, Jr. (1815-85), Brigadier General, CSA (SC). He was at Fort Sumter, on the staff of President Jefferson Davis, Aide to Genl. Beauregard, CSA Provisional Congress. 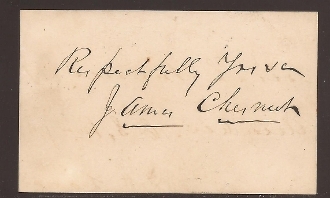 Card Signed (CS) with sentiment. Mounting residue verso, otherwise fine.